Belmond La Residencia is a place that knows luxury—and life—is best served chilled. Clinging to a hillside in the charming village of Deià, the hotel offers unrivalled views over the Tramuntana Mountains and the sparkling waters of the Mediterranean Sea. Breathe deeply as you wander through a maze of sweet-scented citrus trees, keeping an eye out for olive groves that are older than the hotel’s historic buildings. Our housemade olive oil is served throughout our restaurants and incorporated into treatments in the award-winning spa. The heart of Belmond La Residencia beats from two manor houses that date back to the 16th and 17th centuries. Behind the honey-coloured stone walls and pale green shutters you’ll find original beams are complemented by whitewashed walls. Come summer, the cooling terracotta tiles fend off the heat of the sun. Should you wish to explore, the hotel is cradled by UNESCO-protected countryside which entices hikers. Guests can also venture out on two wheels with a professional cyclist as a guide. Those in search of something a little more high octane should explore via vespa—we’ll even pack a picnic for you. Gastronomy is, after all, our pride and joy. Under the steady hand of Chef Guillermo Mendez, who has been with the hotel for almost three decades, we champion both Mediterranean cuisine and wine from a burgeoning local scene. While the hotel’s fine-dining options include the romantic El Olivo, you can also choose to take it easy over tapas at Café Miró. Named after the celebrated Spanish artist, you’ll find 33 of his works adorning the walls. Art abounds in every corner here. Beyond our in-house gallery, there are over 750 original works by locals artists displayed across our rooms. Visit the studio of Alan Hydes, our resident painter, for an art class. Or create something three-dimensional with resident sculptor Juan Waelder. Our bi-annual art competition supports emerging artisans from the community. It’s this kind of commitment to our environment that has led locals to call us La Res. We hope you will too. The double classic rooms offer every comfort and include elegant antique Mallorcan furniture and a queen bed. In keeping with the architecture of an old manor house, each room is different and some feature high ceilings. All rooms have beautiful views. Room size is 30 square meters. Maximum occupancy is 2 persons (rollaway bed is not allowed). 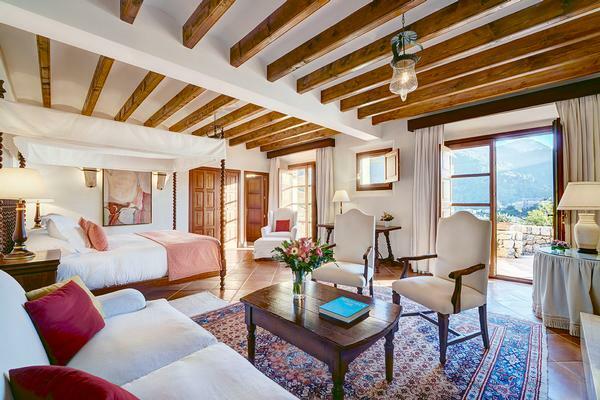 These elegant rooms offer antique Mallorcan furniture and a queen-sized bed. Superior Double Rooms are larger than Classic Rooms and all have a seating area within the room. In keeping with the architecture of an old manor house, each room is different and some feature high ceilings. Some rooms have little romantic corners. All rooms offer beautiful views. Room size is 35 square meters. Maximum occupancy is 3 persons using one rollaway bed. Superbly decorated, with antique and traditional Mallorcan furniture and white linen. Bathrooms are fully equipped and with a bath tub. These elegant rooms offer antique Mallorcan furniture and a queen or king-sized bed. Deluxe Rooms are larger than Superior Rooms and also have a seating area within the room. In keeping with the architecture of an old manor house, each room is different and some feature high ceilings. All rooms offer beautiful views and some have terrace. Some have a separate shower. Room size is approximately 40 square meters. Connecting accommodation available on request, within a Suite category. Furnished with elegant antique Mallorcan furniture and a king or queen-sized four poster bed as well as a sofa bed. separate living room with sofa separated by an arch. Suite size is 45 square meters. Can be converted into a Family Room, accommodating 2 adults and 1 child, using a sofa bed. Connecting rooms available on request. These large elegant junior suites offer panoramic vistas over the village of Deia and Tramuntana mountains. Each suite has a traditional tiled garden terrace with breathtaking views and plenty of space to relax. The spacious king bedroom and lounge area have luxurious furniture and fittings in unique style including the finest quality linens. All feature an open fireplace. The large marble bathroom has a separate shower and bathtub. Suite size is 58 square metres. Maximum occupancy is 2 persons - rollaway bed is not allowed. No connecting rooms are available. These junior suites are the largest in the hotel and offer panoramic vistas over the village of Deià and Tramuntana mountains. Each suite has its own private plunge pool and traditional tiled garden terrace with breathtaking views and plenty of space to relax. The spacious king bedroom and lounge area have luxurious furniture and fittings in unique style including the finest quality linens. All feature an open fireplace. Suite size is 60 square metres. Maximum occupancy is 2 persons - rollaway bed is not allowed. No connecting rooms are available. Located in the Son Fony building the Deluxe Suite has a separate bedroom with a super king-sized bed and a spacious lounge area with luxurious furniture and fittings in unique style including the finest quality linens. Wet bar available. Lovely views from terrace towards the village. Large bathroom with separate shower, separate WC/bidet and double basin. Suite size is approximately 100 square meters. Maximum occupancy is 3 persons using 1 rollaway bed. Connecting Room available on request. Located in the Son Fony building, with views over the village of Deià and the Tramuntana mountains. The comfortable bedroom with a super king-sized bed has an adjoining bathroom with dressing area, separate wc and shower areas. Leading off from the lounge is a terrace with private swimming pool (8 meters x 4 meters), outdoor dining area and a covered pergola with seating. Maximum occupancy is 3 persons using 1 rollaway bed. Suite size approximately 130 square meters. Connecting Rooms available on request. The Presidential Suite is ideal for privacy and relaxation, featuring beautiful views over the village of Deià and the Tramuntana Mountains. Located in top of the Son Fony building, this suite offers a very spacious lounge area with luxurious fittings in unique style including the finest quality linens. Also included are expansive private gardens, a lovely large terrace area with a private swimming pool (8 metres x 4 metres) and space for outdoor dining. A separate lounge with a sofa bed leads out onto the lovely large terrace area. The sumptuous bedroom has a four-poster super king-sized bed and an adjoining bathroom. Suite size is 137 square metres. Maximum occupancy is 3 persons using 1 rollaway bed. Can be converted into a two bedroom Suite, connecting with a Superior Room. This option is available on request. The Villa is a luxurious former private residence, located a short walk from the hotel and overlooking the village of Deià. It is a deluxe self-catering accommodation offering stunning views of the hillside and Mediterranean. Built on three levels, the Villa has three bedrooms - two with a queen bed and one with one twin bed. Decorated in traditional Mallorcan style, the property is an ideal base to explore the charming surroundings and only a short walk from an assortment of museums, shops, restaurants and elegant buildings made from local stone. Amenities include a dining room, living room with open fireplace, a fully equipped kitchen, barbeque, an outdoor terrace and heated private swimming pool complete with sea views. Also included are central heating and air conditioning, a personal safe, sofa, CD and DVD players, fax machine, complimentary wireless Internet access, a stereo and widescreen TV. Also included is a welcome package on arrival, daily full buffet breakfast at the hotel and daily maid service. Guests are entitled to use the hotel's facilities and services including the indoor and outdoor pools, restaurants, tennis courts, spa and seasonal shuttle service to the cove nearby. Villa size is 170 square meters. Maximum occupancy is 6 persons. No connecting rooms are available. The hotel's resident artists can arrange fun painting and sculpture lessons for both kids and adults. A brand-new Kid's Club is available at the hotel to entertain all the little guests with plenty of fun activities. Tennis lessons for both kids and adults can be arranged in the hotel's tennis courts. A complimentary shuttle service to nearby Cala Deià is available for guests. A superbly equipped gymnasium with sauna and steam room is available for guests. The gym offers: free weights, cardiovascular machines and private training sessions with our on-site personal trainer. Many guests are golfers who take advantage of Mallorca’s 20 golf courses to practice their sport. The hotel can reserve these for the clients. Guests also have the use of an outdoor Jacuzzi with spectacular views over sea and mountains. The hotel has two floodlit tennis courts with cushion floor, which are in a magnificent setting, with a backdrop of mountains and sea. The hotel's resident tennis coach, assuring all players of improved techniques before they depart from the hotel, gives tennis classes. Guests can enjoy a complimentary daily boat tour along the coast to discover the beauties of the coast. The hotel boasts a brand-new seasonal Kid's Club with plenty of fun activities for all little guests. The hotel offers plenty of activities to entertain its younger guests. Cooking classes, painting lessons and tennis lessons are just a few examples. Guests can take part in fun lessons to learn how prepare delicious Mallorquin flavoured oils. Belmond La Residencia can organize enticing guided excursion and trekking in the Tramuntana Mountais, UNESCO World Heritage Site. The hotel boasts beautiful gardens, an orchad and an olive grove. Guest can choose among a range of different treatments in the Spa or enjoy an outdoor massage with a view. Guests can walk in the hotel's olive groves and enjoy a donkey trail with the resident donkeys. Deià and Belmond La Residencia are the perfect setting for your meeting, seminar or VIP gathering thanks to the quiet location in the heart of the Tramuntana Mountains. The hotel boasts different meeting rooms and function spaces, each with its own unique characteristics and to suite all your business needs. You can also have smaller meetings and cocktail parties in some of our top suites, to enjoy all the privacy of their gardens with private pool. The breathtaking beauty surrounding Deià, coupled with our event planning expertise, makes Belmond La Residencia the perfect venue for your wedding. The hotel's elegant function rooms range from small and stylish to grand and stately. Our lovely gardens are also available for cocktails. Complimentary Yoga and Thai Chi lessons are available once a week. Private Yoga and Thai Chi lessons can be organized upon request at an additional charge. El Olivo, crowning jewel of La Residencia and perhaps one of the finest restaurants in Mallorca, takes the art of dining to yet another level: the seduction of the palate. Accompanied by candlelight makes dinner at El Olivo even more romantic. El Olivo is a refurbished 16th century olive press, the most romantic setting in Mallorca, offering a star-studded menu and equally impressive wine list, a must for all epicures. The Pool Restaurant, which runs alongside the main swimming pool, is open seasonally. 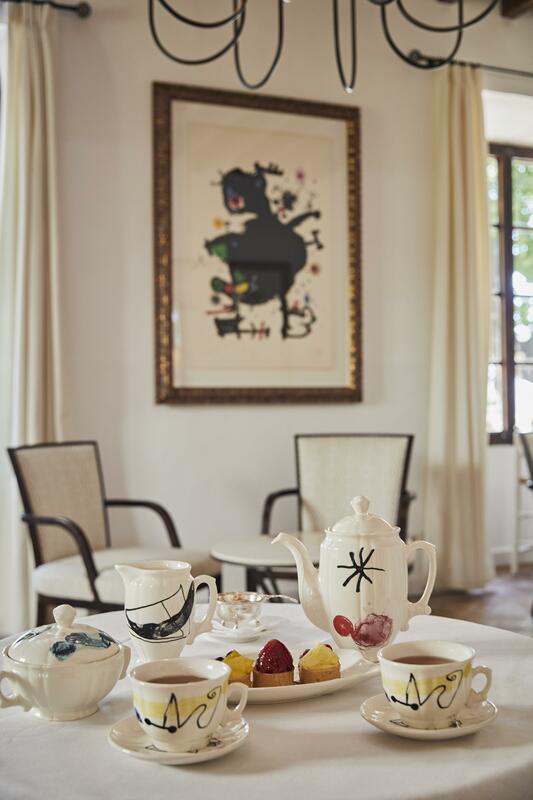 Celebrating Deià's artistic heritage, Café Miró is a bar and bistro offering lunch, afternoon tea and dinner. You'll also find a delicious selection of Mediterranean tapas. In winter you can chat or read by the inviting log fires. 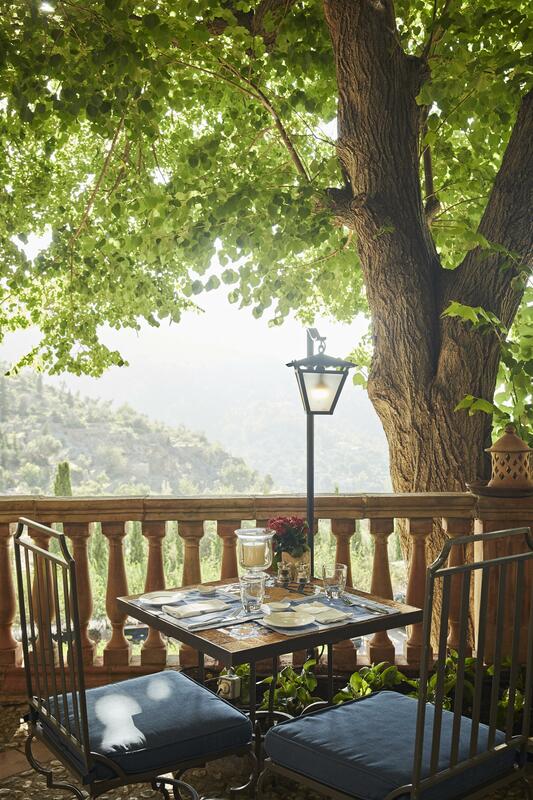 In summer, enjoy pre-dinner cocktails on the terrace overlooking Deià. Deià is a privileged enclave. The village nestles between the Mediterranean Sea and the Tramuntana mountains, with the Teix peak being the highest mountain you can see rising up behind the hotel. Every season of the year is magical here. In summer the coast is inviting, whether it is to take a boat trip, go fishing, diving, swimming, or to simply soak up the sun or have a drink or a meal of fresh fish at the beach bar. In the cooler months, the local hills and mountains are wonderful for walks, hike or climb - depending on one’s individual capabilities. The village itself, although it receives visits by many tourists in the summer, has remained unchanged by tourism. The locals still maintain their customs and celebrate the local “fiestas” unperturbed by foreign onlookers. When the sunsets and the visitors leave, the village returns to its former tranquillity with locals meeting in the bars for a quiet drink and to catch up on the day’s news. One “community” which now forms an integral part of the village life is that of the artists. Several decades ago artists who visited Deià in order to reflect on canvas the beautiful natural setting, decided to make this idyllic place their permanent home. Over the years many more have joined them, together with writers and poets, who now form a well-established community. One of the earliest of such writers to make his permanent home in Deià was Robert Graves. He found inspiration in the mountains and is buried in the local cemetery, which you will find by the church on the hilltop. The hotel offers very special tours of the village during which guests can meet local artists and visit their studios together with the curator of the hotel's collection, Cecilie Sheridan. Feel closer to nature with a trek along the Serra de Tramuntana, a World Heritage Site. Together with an expert mountain guide, guests will discover the best paths and admire the landscape that has long inspired visiting and local artists. See the island like never before on one of the hotel's Vespas. Admire the sun as it sets into the sea at Son Marroig, or drive through picturesque citrus groves towards Sóller. For those seeking an authentic taste of Mallorca, take a trip to the charming village of Fornalutx. Belmond La Residencia is situated in the charming village of Deià, nestled beneath the towering Tramuntana Mountains in Mallorca. The village is just a stone’s throw from the Mediterranean and thanks to its inspiring surroundings it has been chosen as residence by a number of writers and artists. From the Airport follow the signs to Palma and just before you get to the city you will see exit signs for the “Via de Cintura” which you must take. Stay on this road until you see an exit sign for “Valldemossa” which you should take. Head towards Valldemossa. The road climbs towards the mountains. When you get to mountain village of Valldemossa you pass straight though and after leaving the village you will see a right hand turn to “Deià”. Take this road which winds along the coast offering spectacular views, and you will come to the small village of Deià. Drive through the center of the village and you will see a sign for the Hotel on the stone wall at the right hand side of the road. It is very sharp turn right up the hill to the Hotel entrance.